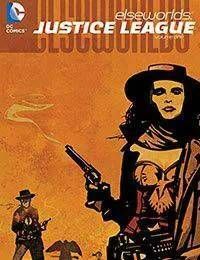 In Elseworlds, heroes are taken from their usual settings and put into strange times and places-some that have existed, or might have existed, and others that cant, couldnt or shouldnt exist. The result: stories that make characters who are as familiar as yesterday seem as fresh as tomorrow.Featuring the League of Justice battling the insane sorcerer Luithorr, Diana Prince and the Justice Riders against the evil robber baron Maxwell Lord, Batman and Superman as pulp heroes, a gender reversed Worlds Finest teaming up to save Lex Luthor and other tales!Now, for the first time, the Justice Leagues prestige format Elseworlds tales are featured in a new graphic novel collection. Collects ELSEWORLDS FINEST #1-2, ELSEWORLDS FINEST: SUPERGIRL &amp; BATGIRL, JUSTICE RIDERS, LEAGUE OF JUSTICE #1-2, TITANS: SCISSORS, PAPER, STONE, and WONDER WOMAN: AMAZONIA!